In 2012, the turnover of China's concrete machinery industry declined significantly, and the rate of decline of some enterprises reached 40%. The future development of the concrete machinery industry has become a major concern for everyone. In fact, this is a systematic project of an industry. In addition to in-depth understanding of the industry, we should be familiar with the upstream and downstream development of the industrial chain. In particular, cement, ready-mixed concrete and other related industries and national policies are almost the industrial pillar of the development of concrete machinery. The current development trend of the industry According to the statistical data of the Concrete Machinery Branch of the China Construction Machinery Industry Association in the past 10 years, at present, the retention of concrete machinery in China mainly includes 33,931 mixing stations (buildings) with a volume of 50m3/h or more, and 44,993 concrete pumps. 39889 cars, 228,822 mixer trucks. The number of concrete mixers above 350L was 200721, with a total of 548,356 units. Other products not included in the statistics are expected to account for 10% to 15%. According to China's national conditions, it is stipulated that the depreciation life of the mixing station (building) is 10 to 12 years and that of the pumping truck is 8 years. However, in actual use, there are many projects of large projects, generous quantities, and continuous operations in China, and many devices such as pumps and Pump trucks need to be replaced in 5-6 years. Therefore, in addition to the new and depreciated demand, concrete machinery still has a large demand in the past five years. 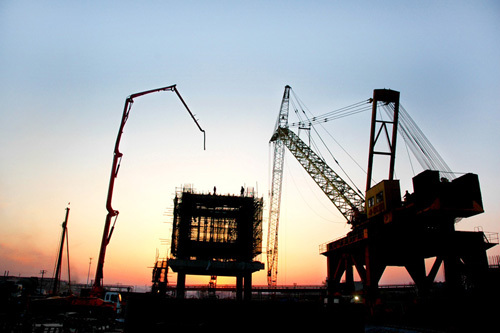 Potential risks need to be vigilant First, the development of construction machinery, especially concrete machinery, has mainly benefited from national investment and policy initiatives. Due to the low-cost expansion, China's concrete machinery industry has completed the development history of over a hundred years in foreign countries in just over 20 years. However, at present, the country has begun to gradually change this mode of relying solely on government investment to stimulate economic development. At the same time, cement and iron and steel industries that are closely related to the development of the concrete machinery industry are all industries with high resource consumption, high energy consumption, and high pollution, and their sustainable development is constrained. The kind of quick-improving role that was previously used will be greatly reduced. Secondly, the current view of the concrete machinery industry is that by 2015, due to the depreciation of a large number of active products, it needs to be replaced. The annual demand for pump trucks is 30,000 and the number of mixing trucks is 100,000. During the heyday of foreign infrastructure development, the number of US concrete mixing plants was 10,000 (including 25m3/h mobile), Germany was more than 3,000, and Japan was more than 4,000, while China included 25m3/h in the past 10 years. The amount of holdings in the mixing building (station) will reach 50,000 or more. In particular, under the temptation of 4 trillion investment in pulling and zero down payment, low down payment and other bad sales promotion models, the advance consumption of a considerable number of users has caused a false prosperity in the market, causing everyone to misjudge the market prospects and eventually lead to corporate funds. The chain is severely disconnected. Therefore, by 2015, even if the mixing plant is used for 10 years and the pump truck is used for 5 years, the depreciation rate will not reach the above prediction. Moreover, the utilization rate of commercial concrete machinery in the country has been less than 65% in recent years, so this prediction lacks the basis for actual investigation. Second, overcapacity will inevitably lead to disorderly market competition. If we say that the current concrete machinery industry is three-legged, it is better to say that the spring and autumn and the Warring States period: large companies dominate, small businesses are crowded, and Chinese companies are wise to keep themselves. In order to seize the market, companies launched a series of bad promotions and promotion policies including zero down payment, which seriously disrupted the orderly development of the market. Finally, although the performance and quality of China's concrete machinery products have reached the world's advanced or advanced level, the key basic components are almost entirely subject to human control. The right to speak abroad, such as pricing rights and legal norms, can restrict the development of China's concrete machinery at any time. At the same time, the ever-changing international situation will have a profound impact on the development of the industry. As a high-level policy maker of a company, we must consider these issues. Quality competition will replace quantity In recent years, several major companies of China's concrete machinery have merged and reorganized with famous companies from Italy, Japan and Germany. After the joint venture, China has truly become the production base of the world's concrete machinery and achieved industrial monopoly. status. In the future, enterprises will gradually shift from quantity-oriented competition based on output value and size to quality-based competition in higher technology and service areas. From the current situation of various companies, several large companies place more emphasis on improving the technical level, reliability, and service quality of concrete machinery, and develop the international market with the concept of integration between China and the West, and begin to upgrade from quantitative enterprises to quality-oriented ones. It is expected that in the future, there will be several Fortune 500 companies that are mainly engaged in concrete machinery manufacturing. In this process, SMEs with unique characteristics and geographical advantages will be combined or merged by large companies, while those lacking in features and innovation will be directly eliminated. There is a precedent for German manufacturing for 125 years. At present, China's concrete machinery products have reached the advanced level in the world and have entered the ranks of high-end products, which is the pride of China's construction machinery. So where is the future direction of development? With the right development model to the international market, the future development trend of enterprises must be internationalized. So, build a factory in China or build a factory abroad? Have you invested in the modernization of domestic factories and automated production lines, or have you built plants in developed countries or set up factories in emerging countries that are in close proximity to market demand? It is a question that companies need to seriously consider according to their own conditions. China is still a large country with a large demand for concrete machinery. Enhancing the design level and production level of domestic workers in science and technology is still the focus of development. At the same time, setting up factories in emerging countries with large demand for concrete machinery and making full use of human resources, material resources, and market resources in other countries is the best policy. If Caterpillar builds a factory in China, using the Chinese market to establish a new type of innovation model is the foundation for its many years of prosperity. While building factories in the developed countries can absorb and draw on advanced concepts and experiences in technology and management, due to the differences in concepts, cultures, and local policies and laws, it is difficult to merge with each other and the effectiveness is slow. Enterprises should be cautious about this. However, for companies that are oriented toward cutting-edge technology research and development, such as setting up core components for the development of hydraulic valves, pumps, motors, and intelligent control technologies, it is the decision that can accelerate the core competitiveness. For small and medium-sized enterprises, they can build low-end production plants in emerging markets and sell products that suit local needs. Strengthen the training of talents for concrete machinery At present, the industry has always understood that in theory, the cultivation of talent is the fundamental to the development of enterprises. However, whether an enterprise can cultivate and retain talents is determined by the entrepreneurâ€™s philosophy and thinking. Foreign companies have put forward the concept of "employees first, customers second" and believe that the high-tech companies can give workers 1 yuan more welfare, which can generate a profit of 6 yuan. This is a new thinking for entrepreneurs. Protection of scientific and technological personnel's innovation and intellectual property At present, the competition in the international market for intellectual property rights and standards has reached a level of enthusiasm. The integrated innovation level of vehicles, stations, and pumps in China's concrete machinery industry has reached a leading position in the world. These are the results achieved by researchers in the continuous failure and exploration process. However, there are still many companies that have no innovation in manufacturing, no innovation in property rights, no application of property rights, and no protection in application. In particular, SMEs must recognize the importance of intellectual property rights. There are only patented property rights to survive. At present, the combination of the green intelligence industry, new communication technologies and energy systems indicates that the world's third industrial revolution has come. China's concrete machinery industry should actively transform to the third industrial revolution, make full use of modern communication and renewable energy utilization technologies, and use green environmental protection and intelligence as a means to upgrade or reconstruct the technical content and added value of concrete machinery products, so that product performance and quality Maximize the user's needs.